The internal revenue code is found in Title 26 of the United States Penal Code. Title 26 includes the major criminal tax provisions including filing a fraudulent return, failure to file, and tax evasion. The vast majority of criminal tax cases fall under one of these three provisions. Though the three statutes vary in level (felony to misdemeanor), the sentencing for each offense can be nearly identical. This is true because the sentencing guidelines base its recommendation on the tax loss associated in the case. Sentencing in a criminal tax case involves looking at two areas: 1) the statute of conviction and 2) the sentencing guidelines manual. The statute of conviction will provide a sentencing range which should constrain the sentence to a span of years. Tax evasion under 26 U.S.C. §7201 is a felony offense which carries a maximum sentence of 5 years. Failure to file under 26 U.S.C. §7203 is a misdemeanor offense which carries a maximum sentence of 1 year. Filing a fraudulent return under 26 U.S.C. §7206 is a felony offense which carries a maximum sentence of 3 years. The statutory maximums assume the defendant is convicted on one count. Those maximums can raise if the defendant is convicted on multiple counts. For instance, a criminal tax defendant who is convicted on five counts of failure to file can be sentenced to up to 5 years if the trial court runs the sentences consecutively. While the statutory maximums serve as a cap on the defendant’s sentence, the sentencing guidelines provide the range of punishment for the listed offense. For all tax offenses, the starting point for finding a sentencing guideline range is the tax loss to the government. The tax loss will determine the base offense level to begin the guideline calculation. An analysis of the overall sentencing guidelines can be found in a previous blog post. Regardless of the offense of conviction, the tax loss is the most important aspect in finding the appropriate sentence following conviction in a tax case. 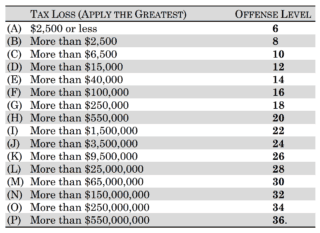 The following table outlines the tax loss and its accompanying base offense level. The guidelines provide that where an offense involved filing a tax return in which the gross income was under reported, the tax loss shall be treated as equal to 28% of the under reported gross income, unless a more accurate determination of the tax loss can be made. USSG §2T1.1(c). The government bears the burden to show the tax loss in a sentencing hearing. The government will often attempt to simplify the tax loss calculation. If a defendant reported $500,000 in income in 2015, and shows gross sales of $1,500,000, the government may claim the tax loss is $280,000 (1 million x 28%). While this argument is technically correct under the guidelines, this sort of bookkeeping would never work in the real world. There are countless deductions, and other exemptions, which would likely apply to the defendant’s estimated tax burden. Though the government has the burden to prove the tax loss, the criminal defense attorney has an opportunity to put forward a real tax calculation under the “unless a more accurate determination of the tax loss can be made” prong of the sentencing guidelines. For example, let’s assume a tax payer owns an offshore fishing guide business. His business showed $2,000,000 in gross sales for 2014 and he reported $500,000 in taxable income. In addition, he is a sloppy business owner and fails to itemize his deductions on his 1040. On paper, it appears he owes the Internal Revenue Service (IRS) a percentage of the $1,500,000 in under reported income. The government would then invoke the 28% rule to arrive at a tax calculation for sentencing purposes. In the real world we know a business does not run on 100% profit. The business owner will have deductions for gasoline, boat maintenance, paying employees, advertising, and a host of other expenses. The courts are required to account for any unclaimed credit, deduction, or exemption that is needed to ensure a reasonable estimate of the tax loss if: 1) the deduction is related to the tax offense, 2) the deduction is reasonably and practicably ascertainable, and 3) the defendant presents information to support the deduction in advance of sentencing to provide an opportunity for the government to challenge the assertion. In this case, the 28% of gross income rule would overestimate the tax loss to the government. If the criminal tax defendant had valid deductions for $1,200,000, his taxable income would be $800,000. Since he reported $500,000 in income, only $300,000 remains in unreported income for 2014. The difference in the sentencing guideline range is powerful in this scenario. Under the government’s theory, the defendant’s tax loss is $420,000 (1.5 million x 28%). In reality, the tax loss is $84,000 if we agree with the 28% flat calculation ($300,000 x 28%). With a tax loss of $420,000, the base level offense is 18 with a range of punishment from 27-33 months. With a tax loss of $84,000, the base offense level is 14 with a range of punishment from 15-21 months. The defendant could save over a year on his potential sentence by getting into the numbers and calculating a true tax loss before sentencing. The statutory maximums and guideline ranges work in unison. If a defendant guidelines in at 87-108 months (7-9 years), the statutory maximum will place a cap on the sentence. If this range was obtained under one tax evasion count, the trial court would be restricted from ordering a sentence over 5 years. If multiple counts exist, the maximum could increase with each count. Four counts of tax evasion would allow the trial court to raise the maximum to 20 years. In this situation, the trial court could order a sentence within the previously stated guideline range. It is important for defense attorneys to review the number of counts, statute of conviction, and statutory maximums prior to any plea deals. It is possible for 4 misdemeanor counts of failure to file to carry a longer sentence than 1 felony count of filing a fraudulent return based on the increase in the statutory maximum and the focus on the tax loss as the sole vehicle for calculating the guideline range. The tax loss calculation is the central focus of all criminal tax sentencing. Regardless of the crime of conviction, the sentencing range will start with the tax loss put forward by the government. In practice, many United States Attorneys will listen to tax loss arguments prior to sentencing. If done correctly, the government may agree to a lower tax loss calculation. From the outset of a criminal tax case, a tax attorney should review the available records and learn the defendant’s business. A review should be done to assess a true tax loss. Calculating the tax loss is not only a vehicle for obtaining a lower sentence. It is also useful for steering a criminal investigation back under the umbrella of the IRS-Civil Division. And in some cases, the review may show the tax payer did not under report his income at all. The defense attorney will have multiple opportunities prior to formal charging to challenge the government’s case through meetings with the Department of Justice and local prosecutors. A persuasive challenge to the government’s tax loss should be another tool in this bargaining procedure. The ultimate goal is to make the government uncomfortable with their previous review of the case and to sink the numbers into an area where certain defenses become more viable. Historically, the government has spent most of its time going after tax payers who cheat the government out of large sums of money. The smaller the numbers, the less animus the government is likely to have towards the defendant. This creates a better playing field for negotiation. Lower numbers also work in tandem with the willfulness defense under Cheek v. United States. It is easier to argue the client did not willfully file a fraudulent return when the unreported income is a manageable number.